There is great pressure on organisations to reduce their carbon footprint and save costs. This pressure is on organisations across the board from retail premises through offices to local authorities. Many buildings have old lighting which can be very wasteful in energy use, and is a prime target for improvement and savings by upgrading to modern energy-efficient lighting. This case study describes how one organisation has improved their lighting, made a contribution to carbon reduction, and expects to make considerable cost savings. The public area lighting in Hitchin public library had been in place for many years and was an obvious opportunity for improvement. Herts county council, along with their consultants The Mace Group, undertook a review of potential savings and improvements in conjunction with lighting specialists, Fluorel. 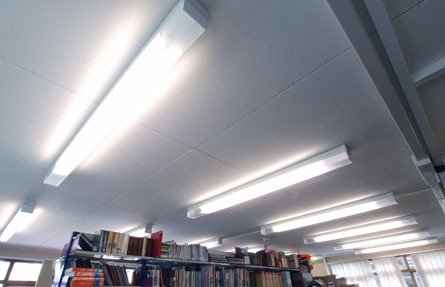 As a result, much of the existing fluorescent lighting was replaced by using the Fluorel retrofit lighting system. This incorporates the latest in lighting control systems and lamps. A key benefit is that it is designed to fit into existing light fittings and utilise the existing wiring. The old control circuits are bypassed. This means that the installation was completed in much less time, with less disruption, and at lower cost than if the complete fittings had been replaced. The replacement lights use much lower energy and are brighter than the ones they replace. This was achieved by a combination of both latest technology T5 fluorescent tubes and modern high frequency control electronics. The installation is targeted to achieve around 40% energy savings. For an installation like this, the expected return on investment is typically between 3 and 5 years. For this project the payback period was defined to be within 4 years. A further benefit is that the lighting environment is improved with modern daylight lamps providing a brighter and fresher environment. With the increasing awareness of environmental issues from authorities, customers and end users, and increasing pressures to save costs, it is expected that more and more existing lighting systems will benefit from being upgraded to the latest lighting standards.